A Visit to the Isles. Apia Correspondence of the Alta California. We arrived here from Honolulu on April 1, after a splendid passage of thirteen days—the fastest on record. Entering the harbor just as the sun is sinking beneath the sea, the eye rests on the most beautiful tropical verdure, the beach skirted with palm-trees, in the background bread-fruit, guavas and vii-trees, a cascade leaping from the highest mountain on the island, lends a charm to the scene unsurpassed in any country. The beach around the harbor, for perhaps one and a half miles, is inhabited by Europeans residing on the island. There are perhaps sixty European houses, badly constructed for the tropics, but the people settled on these isolated isles, far away from civilization, seem happy and contented. Indeed, the social life in Apia appears to a stranger to be in a very primitive state. The Scotch reel and Highland fling is danced here, and, as a Frenchman remarked to me, "You English wherever you go carry your games with you, and I feel certain that when I pass to another world, if it should be my bad fortune to be cast into the bottomless pit, I shall find a Scotchman dancing the Highland fling and an Englishman a country dance." A ball at Port Apia is a sight not to be met with in any other place. The assembly generally consists of eighteen or twenty ladies, and perhaps thirty gentlemen, and dancing is kept up with a vim unknown in colder regions. The windows are all open, and the lights reflect upon the shining skins of the naked natives who crowd the verandahs to gaze on the dance of civilization. The native dance, hula, hula, seems to our eyes obscene to the extreme, but our waltz, danced as the Samoan ladies dance it, appears to the natives equally improper. Although the European residents enjoy themselves, the natives have little left to look forward to, for the unhappy fratricidal war that has desolated the country for the past ten years has left these miserable people almost in a state of destitution. Ten years ago the King of the Samoan group died, leaving a son of about twenty years of age, who, according to the established rules, was entitled to step into his father's place, but his uncle, then a high Chief on Savii, fifteen miles distant from the seat of Government, invaded the Island of Upolo with a powerful fleet of war canoes, and defeated the young King, who retreated to the east end of the island; since this time there has been almost continuous warfare, but about two years ago both parties gave up fighting from sheer exhaustion, and ever since have been preparing for war again, and a few days before our arrival hostilities commenced afresh. On the 1st of April two forts were taken by the invading party, and six heads cut off. It is the custom to give no quarter, and when a person is taken his head is at once cut off. The King, seated on a mat, receives the trophy with great joy, and the fortunate warrior who has taken the head calls out the name of the King. The town of Apia is neutral, and either party can enter it without arms with perfect safety, but it impresses one with a singular feeling to see a canoe being paddled across the peaceful bay with the head of a man stuck up on the end of it; or again, to see the natives passing along the beach with large knives about eighteen inches long, perhaps stained with blood, when the head of some unfortunate native has been taken off just a few minutes before. Both parties live in perfect harmony with the European and American people residing here, and there is not a single instance of any outrage being committed on the white residents. The war has been entirely carried on by each party to gain the supremacy, and kept up now because the party that wins will take the lands and property of the others, and will destroy the principal chiefs. This state of things prevailed on the arrival of Mr. STEWART, the President of the Central Polynesia Land and Commercial Company. He at once requested a meeting of the King MALESTOA and his principal chiefs, representing to them that the Company had purchased large tracts of land on the island, and that it was impossible that the war could be continued longer without entirely destroying the native race. "We do acknowledge the absolute authority of the United States of America with regard to all matters whatsoever, and bind ourselves to adopt the common laws of America." This agreement is signed by the two Kings and 120 chiefs, and the British and American Consuls attach their signatures and seals. It is somewhat singular to see so many English people favor the establishment of an American colony in the South Sea Islands, more particularly so on such an island as this is, covering an area of 1,027 square miles of perhaps the most fertile land in the world. The group contains an area of 2,600 square miles, but this island is not to be surpassed for its beautiful climate, luxuriant foliage, and richness of the soil. The highest ridge is at an elevation of not more than 2,000 feet above the level of the sea, and more than three-fourths of the island is suitable for cultivation. The very rocks seem to bring forth vegetation; the eye cannot discover anything but the beautiful tropical verdure. Spices of all kinds are growing spontaneously. The valleys abound with nutmegs, ginger, curri plant, &c. In some parts the ground is covered with pine-apples, while the bread-fruit, guava vie and hica lend a perfect and delightful shade to the traveler. Upolo is like no other place on our globe, and the stranger is forced to exclaim that it was the last place created. The Creator, beholding all the most beautiful things in nature, centered them on the Samoan Group. Sunrise on this lovely spot is splendid beyond conception; everything is filled with life, and nature seems to have bestowed more than their share of beauty to the inhabitants. The central position of these islands, right in the track of the United States, New-Zealand and Australian mail steamers, about 1,600 miles from Auckland, 2,000 from Honolulu, 1,100 from Tahiti, 300 from Fiji, and 1,000 from New-Caledonia, point toward them in the future as being the great depot of commerce in Polynesia. The coaling depot of the steamers is to be at Samoa City, in the harbor of Pango Pango, and our Government has already taken possession of the magnificent land-locked bay as a naval station. It was taken just in time, for fourteen days afterward a German man-of-war arrived there for the same purpose, and when the Captain was told by the pilot that the Narragansett had been there and had taken possession, he said, "It cannot be so," but being assured of the fact, at once sent for the Consul, who told him it was quite true. Despite the desire of some Samoans to become part of the United States in 1872, the US Government decided not to annex Samoa at that time. 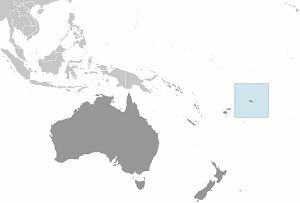 The Eastern portion of Samoa joined the US in 1900 & 1904; Western Samoa was governed by Germany until 1914, when New Zealand took over, until Samoan independence in 1962. 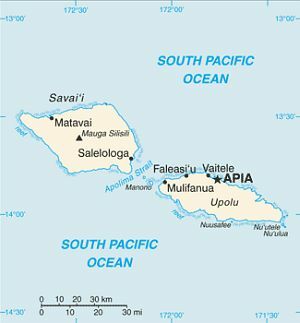 ...At the turn of the twentieth century, the Tripartite Convention partitioned the Samoan Islands into two parts: the eastern island group became a territory of the United States (the Tutuila Islands in 1900 and officially Manu'a in 1904) and is today known as American Samoa; the western islands, by far the greater landmass, became known as German Samoa after Britain vacated all claims to Samoa and accepted termination of German rights in Tonga and certain areas in the Solomon Islands and West Africa. The first German Governor was Wilhelm Solf who later went on to become Secretary for the Colonies of Imperial Germany. New Zealand troops landed on 'Upolu unopposed on 29 August 1914 and seized control from the German authorities, following a request by Britain for New Zealand to perform their "great and urgent imperial service..."
Independent State of Samoa: New Zealand occupied the German protectorate of Western Samoa at the outbreak of World War I in 1914. It continued to administer the islands as a mandate and then as a trust territory until 1962, when the islands became the first Polynesian nation to reestablish independence in the 20th century. The country dropped the "Western" from its name in 1997. APIA, Samoa, April 30.—We have had a social sensation recently in the way of a great Samoan wedding. For months past a leading chief of Falefa, in the Atua district, has been courting the village maid of Apia, Moe, daughter of Seumanutafa, High Chief of Apia, and the new Governor of the Tuamasaga district. And as the chief is an old man and Moe is about 19, it has required the most strenuous efforts of both families to bring about the match. The Falefa family have brought to Apia over 300 pigs, killed and cooked, and distributed them among the young lady's relations. In return for these, the family of the expected bride must give fine mats, siapas, &c., and they have been busily engaged collecting them from all over the islands till the Governor's house is half full. These mats are the most valuable property of the Samoans, and are given at weddings as more substantial presents are at home. They are the heirlooms of families for generations, and are justly prized, as it requires years to make one of them. Some of them are valued as high as $1,000 apiece. Many of them are fringed with red feathers, and are almost as soft as silk. A vast deal of ceremony is connected with these weddings. Yesterday all the maidens from Falefa went in a procession to the Governor's house, each one carrying a stick with a bunch of red feathers suspended from the end. These feathers are very rare nowadays, and are much prized for mat trimmings, &c. All the town fales (native houses) are filled with visitors. At the wedding some member of the Government reads a chapter from the Bible, and then reads a ceremony. The couple being married are seated all the time and join hands toward the close of the ceremony, as in more civilized countries. In this instance the young lady is well and widely known, and is a favorite with the officers of the war-ships of all nations. She is amiable and interesting. But as a rule, Samoan girls have very little to do with the choice of a husband. That is generally arranged by the heads of the families, and from interested motives. When the Governor was asked why he did not marry Moe to a young chief, he replied that if she did not like her old husband she could run away from him, and it would be no disgrace, while a young husband might take a fancy for another wife, and it would be a shame to the family to have him leave her. A young chief generally has wives or concubines all over the islands. Through them he becomes allied to numerous leading families, and acquires extended influence, and when he falls out with one family he goes to another and finds a wife awaiting him. Native dances are taking place nightly and are a part of the wedding festivities. All the young dandies appear on the stage at such a time, and display their fine, manly figures. Also, the leading maidens of different villages assemble on the scene. Their costume is the primitive garb of Eve, and their figures such as might have been seen in Sparta.